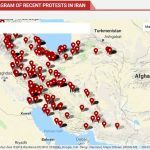 More protests took place across Iran this weekend, as the people of Iran continue to voice their dissatisfaction with the ruling regime and its policies. 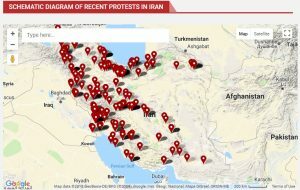 Based on reports from MEK network inside, demonstrations were held in the provinces of Fars, Hamadan, Bushehr, Khuzestan, and Isfahan. The protests came in response to a variety of issues, including water scarcity, low salaries, non-payment of wages, and water shortages. The MEK network inside Iran reported that teachers in Shiraz, in Fars Province gathered in front of the provincial governorate on Sunday to burn their legal bills in protest of judicial sentences that have been issued to teachers. Farmers and gardeners from western Isfahan gathered on Saturday morning in front of the Isfahan Water Organization in the cities of Jowzdan, Najafabad, Qahderijan, Qaleh Sefid, Goldasht, Kahriz Sang, Asgharabad and Khomeyni Shahr to protest the lack of irrigation for their trees. The protesters are demanding sufficient water to irrigate their fields and gardens. The agricultural sector has experienced severe shortages over the past few years as large volumes of water have been diverted from the Zayandehrud River to give to new factories and settlements. A group of unemployed workers from the Semnan Cotton Factory gathered in front of the city’s governorate on Sunday to protest after a number of attempts to collect unpaid wages. The nearly fifty workers of the Rainbow (Rangin Nakh) Cotton Company have been waiting since the company shut down in 2013 for their unpaid wages and severance benefits. The workers say that they have gone to various government agencies over their five years of unemployment, but they have received no follow-ups to their filings and their situation remains unresolved. Drivers from the Hamadan and Suburbs Bus Company protested in the central terminal of the bus company on Sunday against unpaid wages, non-payment of last year’s bonuses, extra hours of work, and incompetence of Hamadan municipality officials. The protesting drivers went on strike, demanding reductions in daily work hours and full payment of wages and last year’s bonuses. A crowd of citizens from Bushehr protested on Sunday against the lack of water and electricity in their city in front of the Bushehr governorate. The protest on Sunday was arranged after a previous call to protest. The MEK network reported that on Saturday, a large group of citizens in Abadan gathered in front of the Abadan governorate in Khuzestan Province. The people were protesting the lack of drinking water in the Arvandkenar district. The protesters held empty bottles as they demanded that the authorities remedy the situation with drinking water in the area and provide them with the water they need. nation’s water resources leaving many Iranians without access to water.